These speakers are in excellent overall condition, this particular pair has no marks to the cabinet. I have a second pair that has a couple of small superficial marks. Thanks to the dedicated midrange drive unit, the midrange exhibits improved resolution and accuracy, while the soft dome tweeter and the midrange and bass drivers each can realize the optimum performance possible within their characteristic frequency ranges. 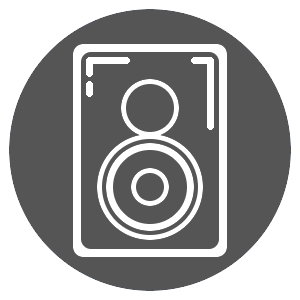 The woofer and mid/range diaphragms are comprised of the MSP material developed by Dynaudio, and achieve a perfect sonic integration via the finely-tuned and phase-consistent high-grade crossover. The dual 18 cm woofers have been developed especially for the Focus 340 and feature extra-large cone surfaces, the new black Kapton® voice coil formers and rigid diecast aluminum baskets, all housed in an ultra-rigid cabinet construction. The result is an impressive floor-standing loudspeaker with an incredibly dynamic, fast, accurate and open sonic performance, mated to a deep, powerful yet extremely precise bass response. 8.7 x 43 x 12.1"